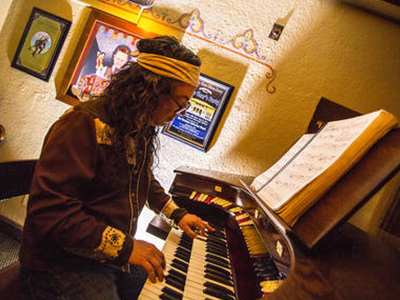 On Thursdays, Steve Kerin entertains the Chapel Pub by playing all of your favorite songs, but in a way that you have never heard them before – on solo pipe organ! The audience is encouraged to request tunes from a list of nearly a thousand songs. They range all the way from pop to heavy metal, jazz to movie themes, '80s hits to oldies. It's charming and fun to hear these songs on an actual pipe organ – that's with pipes, chimes, and all – in an old church. You've got hear this! In the spring of 2005 Steve Kerin got in his car in Lafayette, Louisiana, and pointed it west. After camping and gigging his way through deserts, truckstops, bars, and nightclubs he decided to park it in Portland, Oregon. Born and raised in the Heart of Cajun Country, Kerin discovered piano at the age of four. While studying classical music in college, he discovered such New Orleans piano greats as Dr. John, Professor Longhair and James Booker. He soon found himself playing regularly with such Louisiana greats as "Big Daddy" Harry Hypolite, former guitarist for Zydeco great Clifton Chenier, as well as Grammy-nominated songwriter David Egan. In 2005. he played at the New Orleans Jazz and Heritage Festival alongside such artists as Randy Newman and The Black Crowes. Kerin is a true student of the New Orleans style, and his playing is complex and dense. His voice has the gruff quality needed to 'sound' like New Orleans. His piano performances have been with groups as varied as his musical talents -- from jazz to rock to blues to classical to wherever his talent and soul take him.